Can you believe that 2015 is almost upon us? I know that we say it every year, but really, where did the year go? My Grandmother always said that the older you get, the faster time flies and boy is that true. 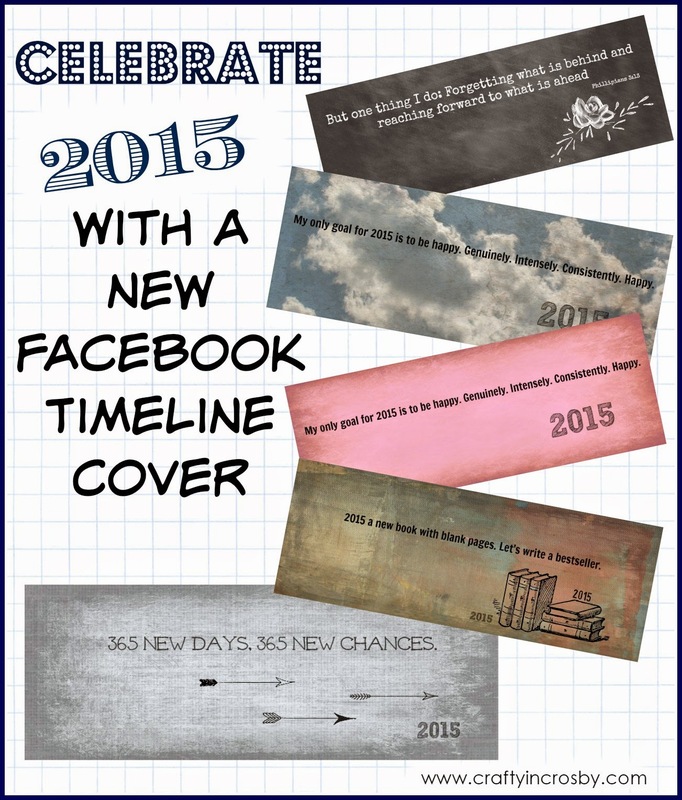 To help start 2015 out on the right foot, we've designed a few Facebook Timeline covers for you to use. The first one is from Sunday's sermon and it is just perfect to start out the New Year - don't you think? 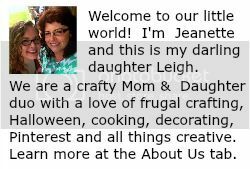 Leigh came up with the other quotes. She's a big Tumbler fan and saw most of them there and then I designed the layouts in our favorite online graphics program PicMonkey. We hope that you can use one of these for your personal or blog Facebook page. Did you notice our new blog design? Thanks so much to Jenny at Studio07 Designs! Talk about the easiest thing we've ever done! I mean, within a day and half, she had our new design installed and up and running. And we just love it! So here's to a wonderful New Year! Let's make it an awesome one! Christmas is such a stressful time for most of us. I hope that you are taking time to enjoy the magic of the season! We haven't had much time for blogging this month, but we hope to be back at it after the New Year. 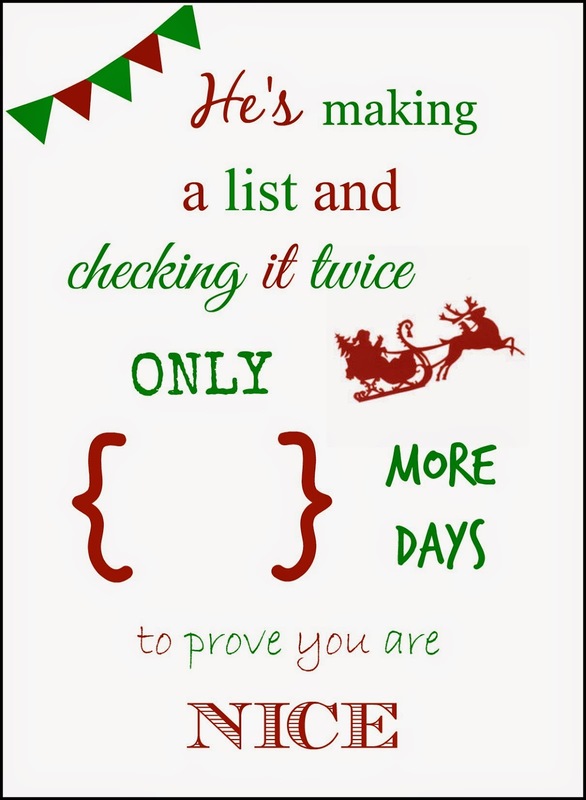 I did find time to put together a couple of printables for you. One with one of my favorite Bible verses and one with a line from my all time favorite Christmas movie. Merry Christmas from Crafty In Crosby! 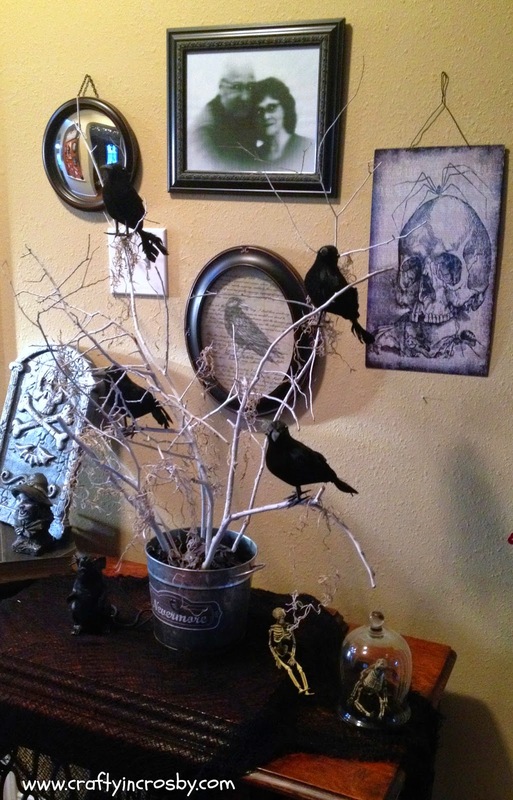 This is a repost of one of my favorite decorations from last year. Hope you enjoy it! I was blessed to have a Mother who loved to read and passed that love along to me. I also married a book lover and raised Leigh up to be one too! Being a book lover, I'm also a library nerd and saw this awesome idea at our local library here in Crosby. As soon as I saw it, I knew that I just had to have one of my very own. 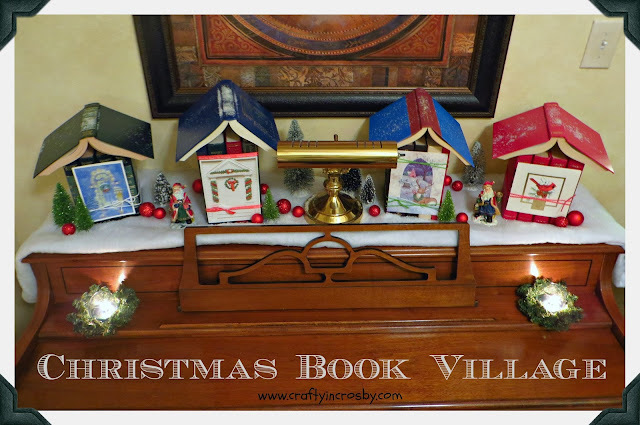 Christmas houses made of books? Two of my most absolute favorite things and I knew just the place to put it - on the piano in Mr. Crafty's office. This is so incredibly easy and doesn't damage the books in any way. Just take four to five books (depending on how wide you want your house to be), find an appropriately sized Christmas card for the front and tie the card on to he books with yarn, string, or ribbon. Then open a book for the top. Add a little snow batting, bottle brush trees and fake snow and you have an adorable village. I can tell you that this is going to be a permanent fixture of our Christmas decorating for many, many years to come. 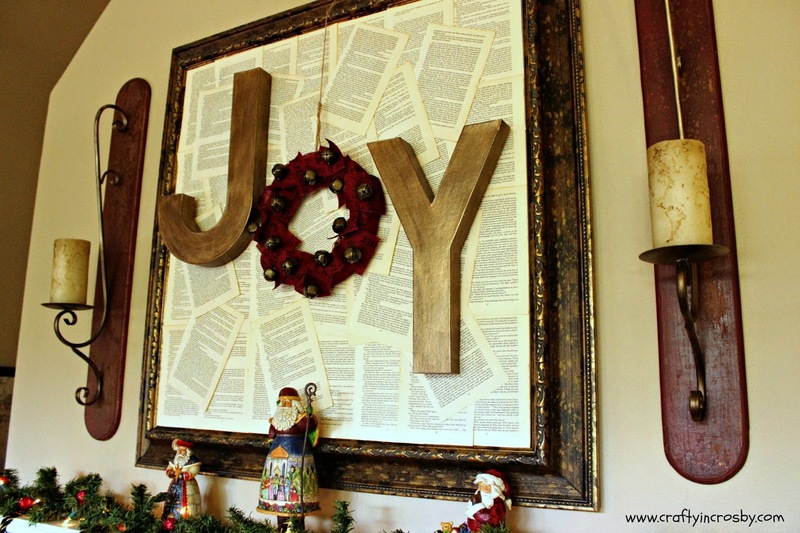 It is just adorable and made of books which is something we have an abundance of! Readers Digest books are the perfect size for this and since we collected them for most of the 90's - we have them in every color under the rainbow! So easy, quick and cheap!!! Stress free Christmas decorating at it's finest. Wishing you all a happy and stress free Christmas! 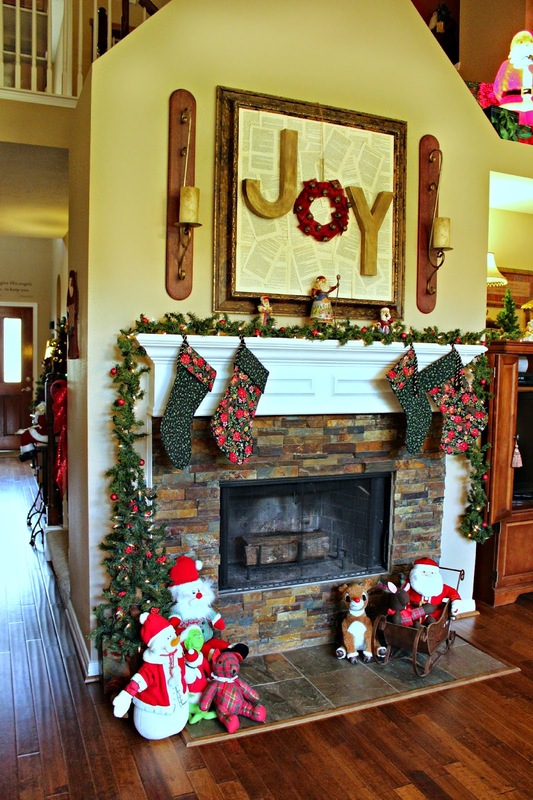 Pinterest is just the most amazing place to find holiday decorating inspiration. 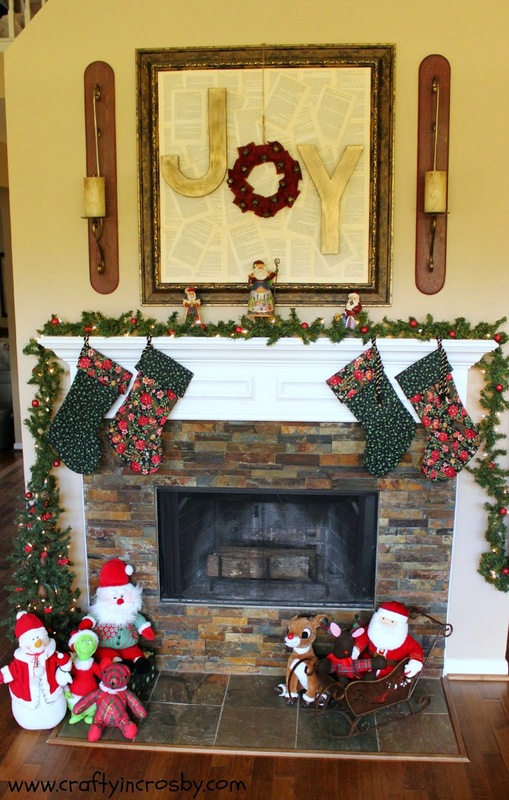 After seeing all the beautiful Joy and Noel signs using wreaths and snowflakes for the O's, Leigh and I decided that we needed something new for our mantel along those same lines. 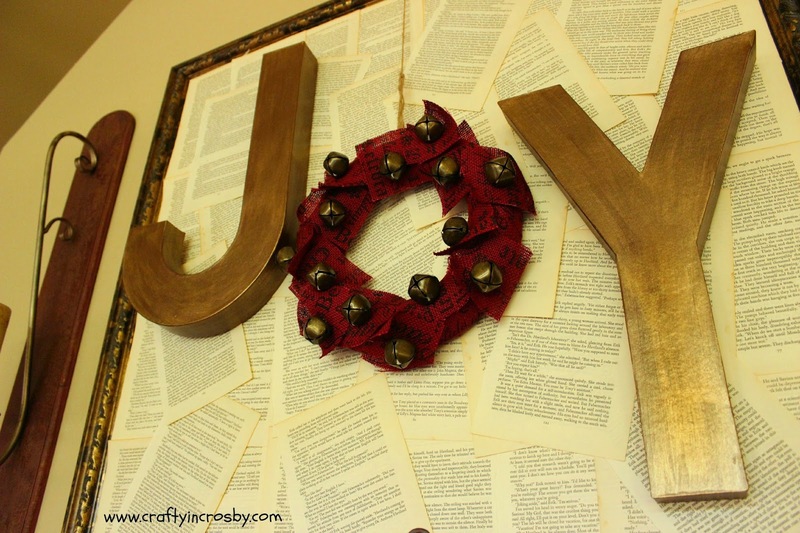 The cardstock letters and burlap wreath came from Hobby Lobby. 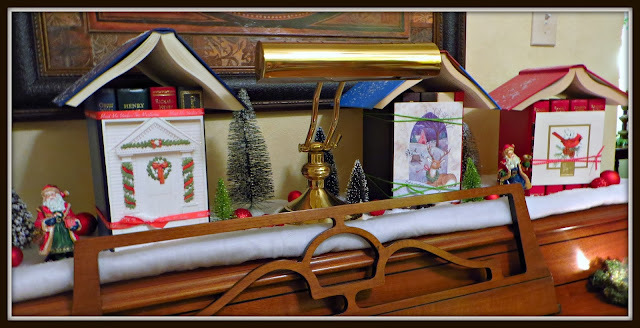 I was originally looking for an evergreen wreath, but Leigh found this one and it was perfect! We painted the letters dark brown and then used a metallic top coat. You'd never believe that the J started out as a U would you? By the time we got to Hobby Lobby Friday evening, all the J's were gone!! X-acto knife to the rescue and the U became a J! So hard to get good pictures of our mantel because the sun shines on the fireplace but above the mantel is all shadows. Sigh.....maybe someday I will figure it out, but for now these picts will have to do. I really love how it turned out. Such a change from our usual bright and blingy wreath that we've had for the past several years. These colors are more subdued and natural and go much better with our decor. 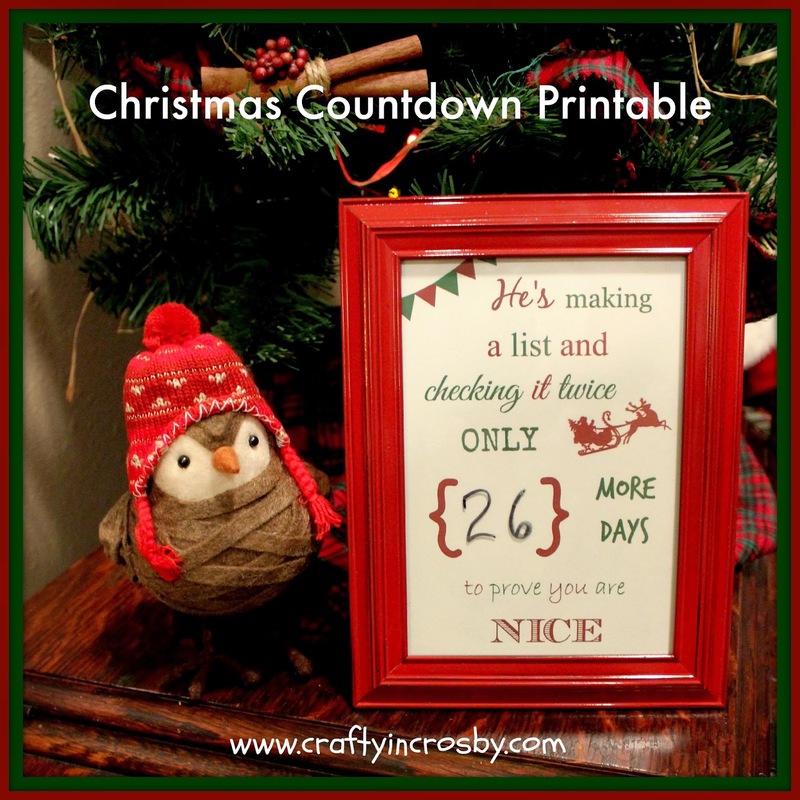 Hope you are finding time to squeeze in some holiday crafting during this crazy, stressful, yet joyful month. 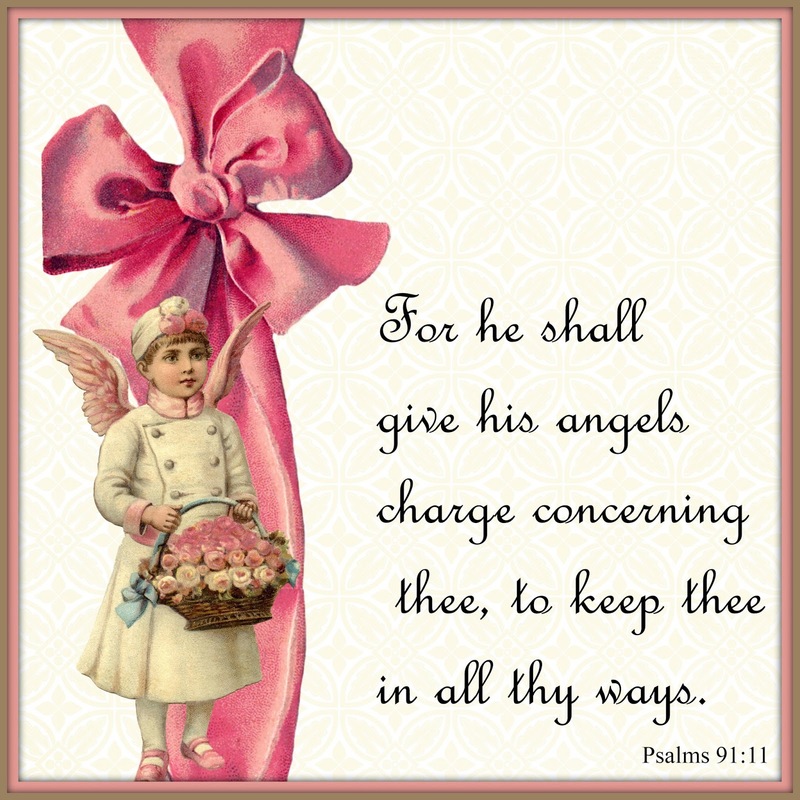 May Peace and Joy be your gift at Christmas and your blessing all year through! 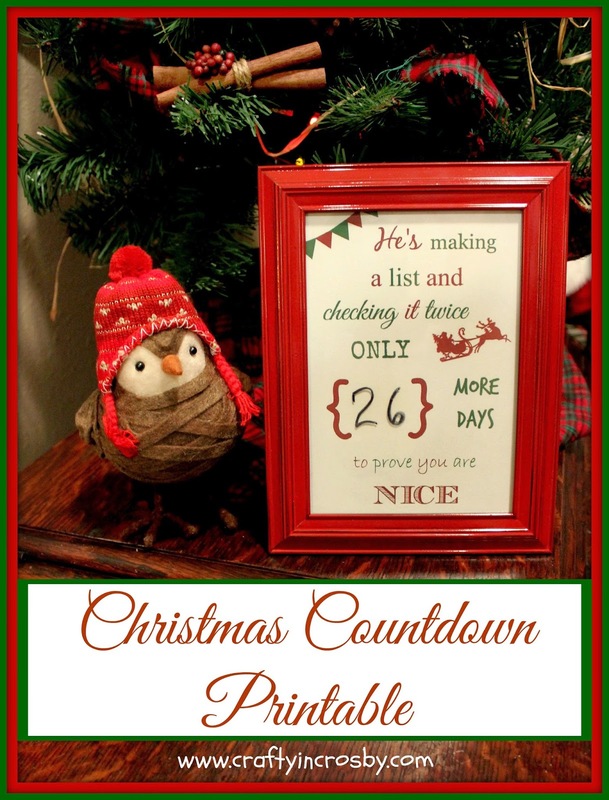 Not to add to your stress level, but the time has come for that annual Christmas tradition - The Christmas Countdown! 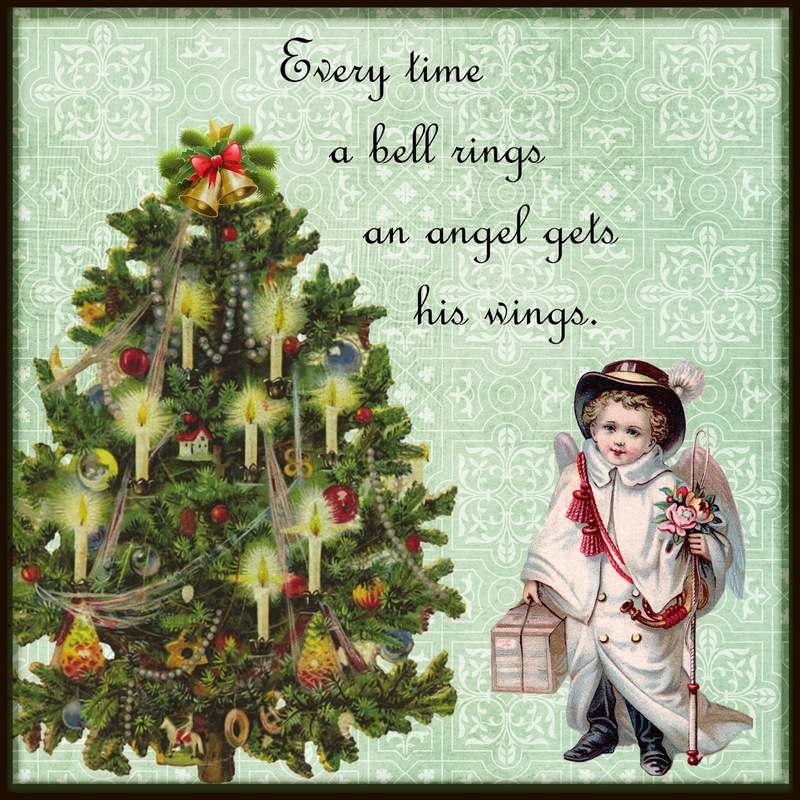 I decided that we needed a new one this year and designed this one in PicMonkey. I wanted ours for the fridge so I added magnets to the back. That way it can be used either way. 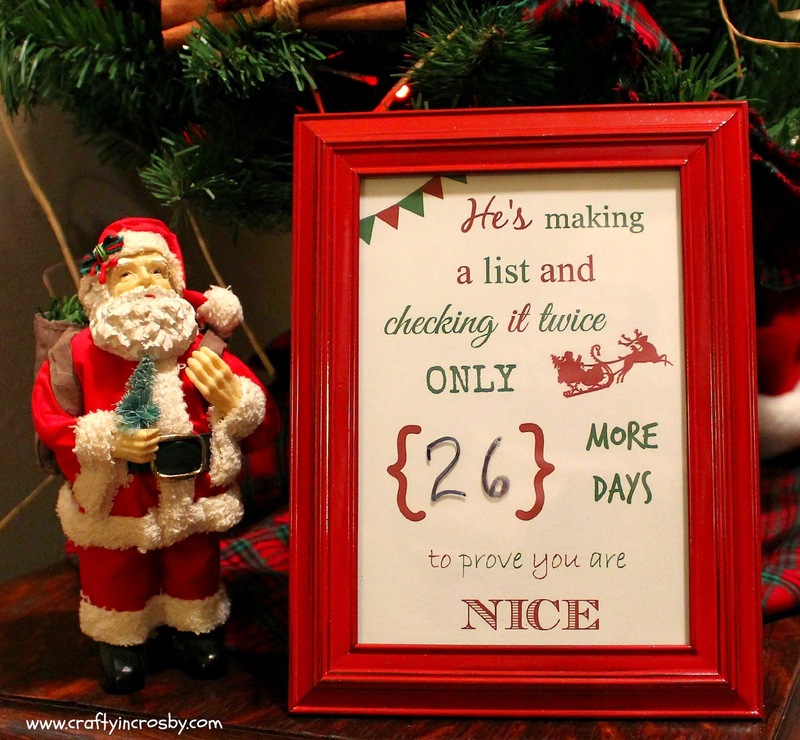 Super quick and easy - just download and print, pop it in a frame and you are good to go! Our frame came from Dollar Tree (5x7) and a quick coat of glossy red spray paint makes it pop! If you have a stainless or white fridge, you could probably just leave the frame black. 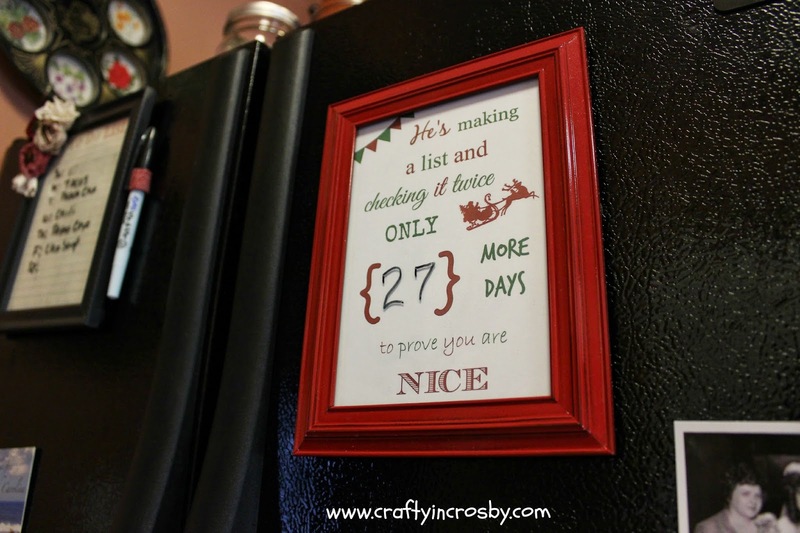 This would be great to hang on the fridge if you have little ones or Grandkids and let them change the number each day. Heck, it would be great even if you don't have little ones - we all need to work on being nicer right? Especially during Christmas! Hope you all had a wonderful Thanksgiving because the countdown has begun! As my children and Niece and Nephew have grown over the years, I have struggled with ways to make their Christmas memorable and fun. Even though they are grown, and my Niece and Nephew have kids, I still want to make Christmas magical for them. As everyone knows in our family "If you don't believe you get underwear!" so they all still believe in the magic of Christmas. 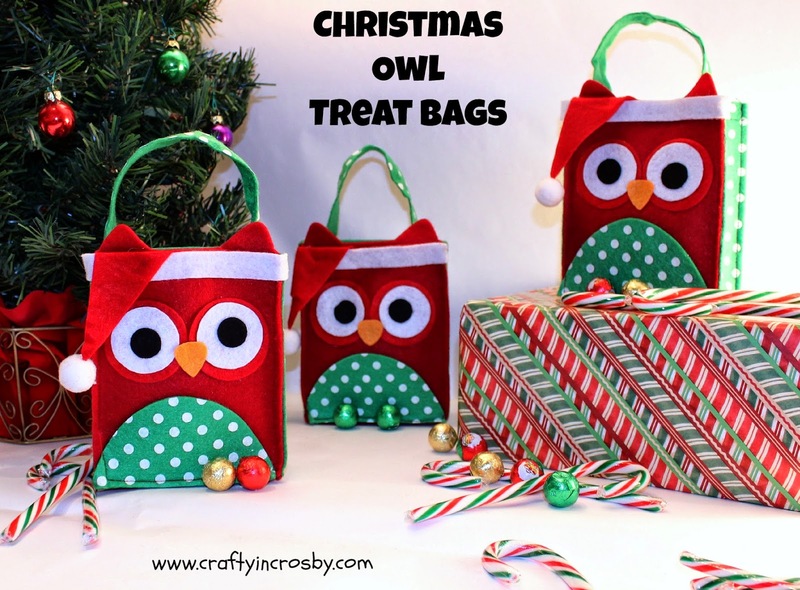 I was recently contacted by Lilian Vernon to review one of their products and fell in love with their adorable Christmas Owl Felt Treat Bags. I just knew that they would be the perfect little gift holder for the grown and not so grown children. Once I get our tree up this Friday, I'm going to hang these on it for all the kids to have on Christmas Eve. I think it will be something we can make part of our Christmas tradition for years to come. 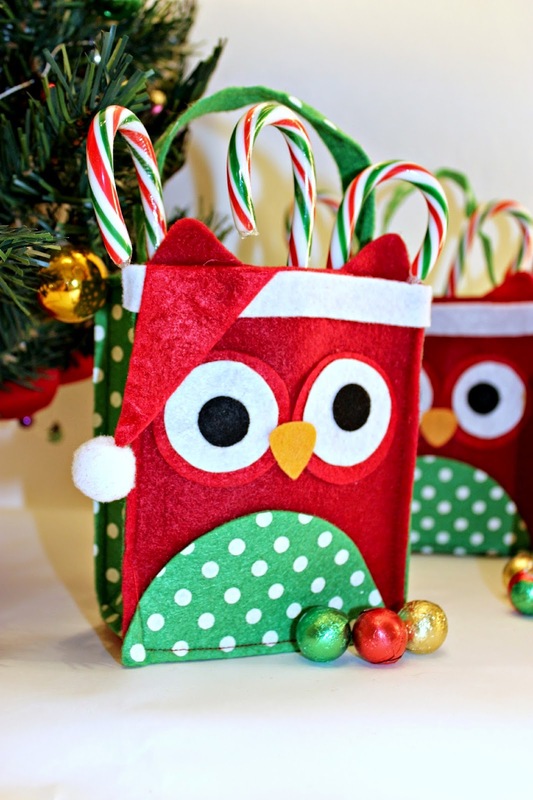 They are the perfect size to fill with everyone's favorite candies and a special little toy or treat. Maybe nail polish for the grown up girls along with a gift certificate for a mani-pedi and hardware store gift cards for the grown up boys. Hey, who wouldn't love a Lowes, Home Depot or Ace Hardware card? I know I would! 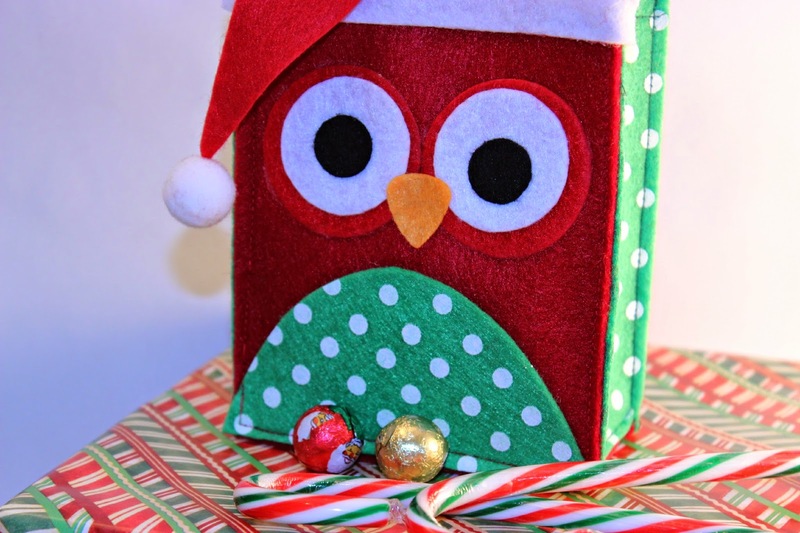 The colors are so bright and cheerful and as you can tell, owls are some of our favorite things out at Crafty In Crosby. 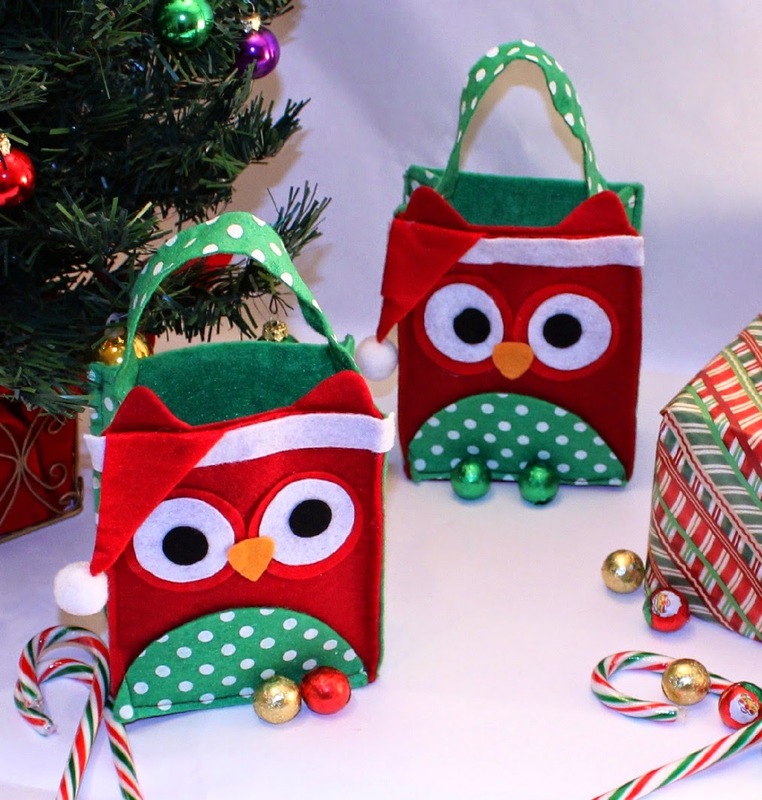 Can you believe that these adorable little bags are only $5.99 for a set of six? I love them so much that I've ordered another set to use for the girls at the office. I'm doing my best this year to order as many products as possible online. Who wants to fight the crowds - they just stress me out, so this year I'm staying home and letting my fingers do the walking! I'll post pictures on Friday with the bags hanging on the tree - I just know they are going to be a hit with the kiddos this Christmas and for many more to come! DISCLOSURE: Lillian Vernon provided these Felt Owl Treat Bags to Crafty In Crosby in return for a review of their product. 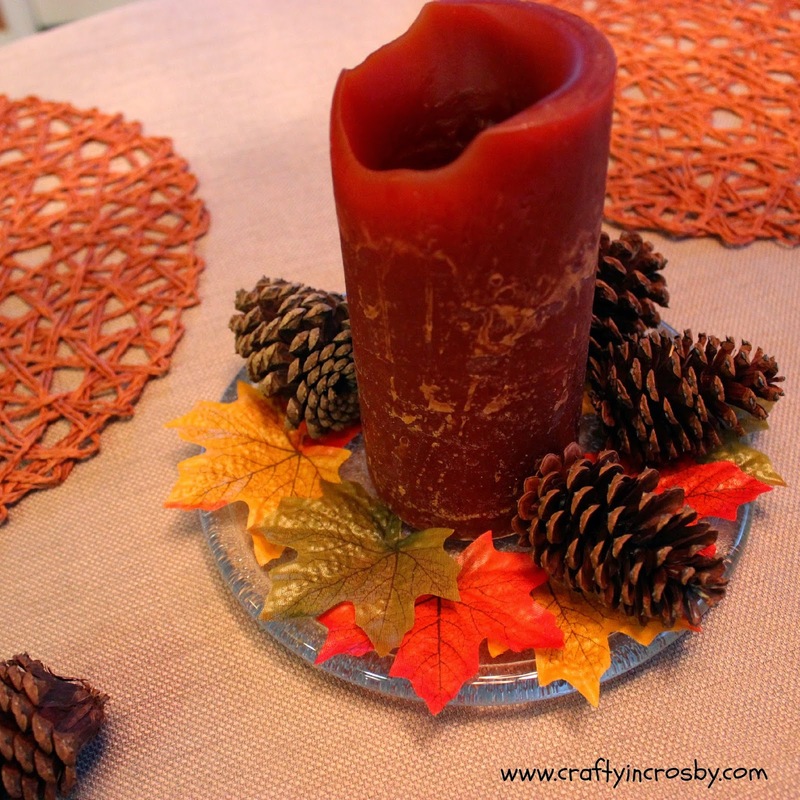 Pinterest is loaded with intricate table centerpieces for Thanksgiving, but sometimes less is more don't you think? 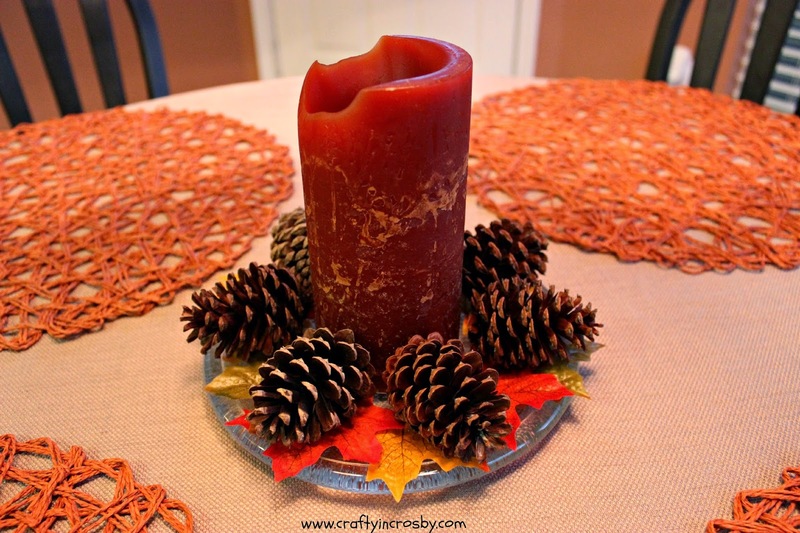 I needed something for our breakfast table last year and threw this together in no time flat - just a candle plate, DollarTree fall leaves, pinecones and a candle. Simple and quick and just the thing for our round breakfast table. 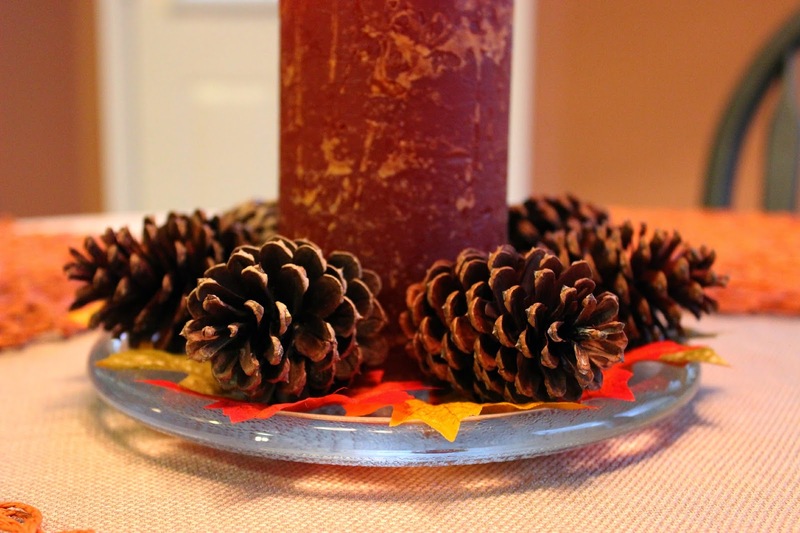 Layer fall leaves around the candle and place the pine cones on top. 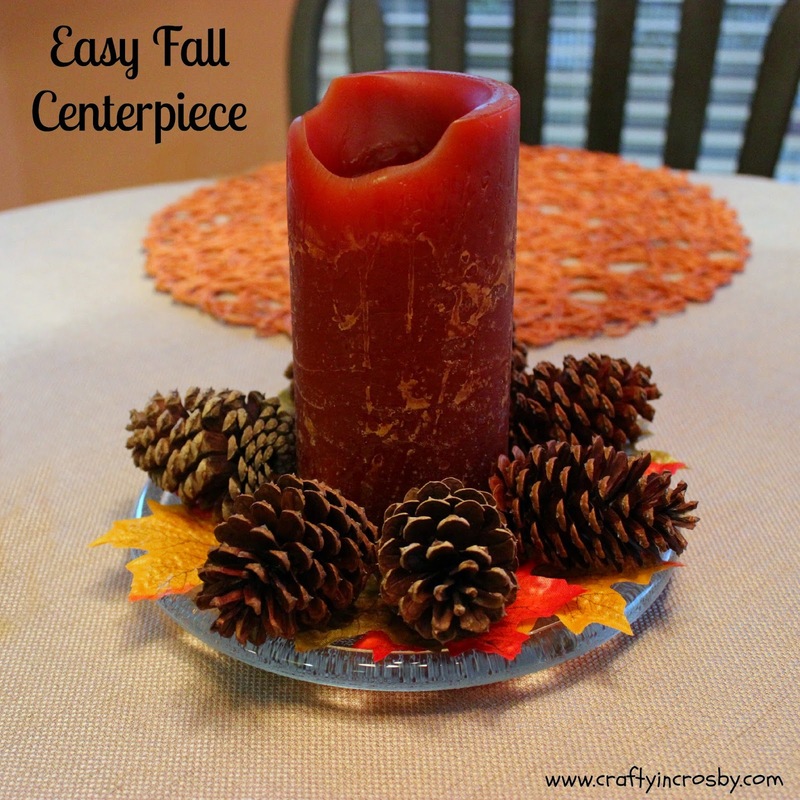 Easy and quick and still looks great this year! Are you ready for Thanksgiving? 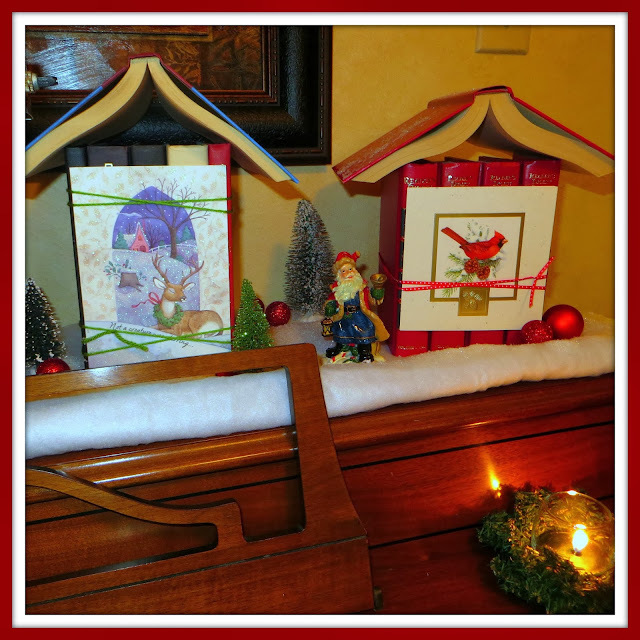 We are traditionalists here (Leigh insists) and don't start decorating for Christmas until the day after Thanksgiving. How about you? Before or after Thanksgiving? Sometimes I think that we don't give enough time to Thanksgiving, plus waiting makes Christmas just that much more special! Don't you just love it when a project turns out even better than you anticipated? This one sure did! 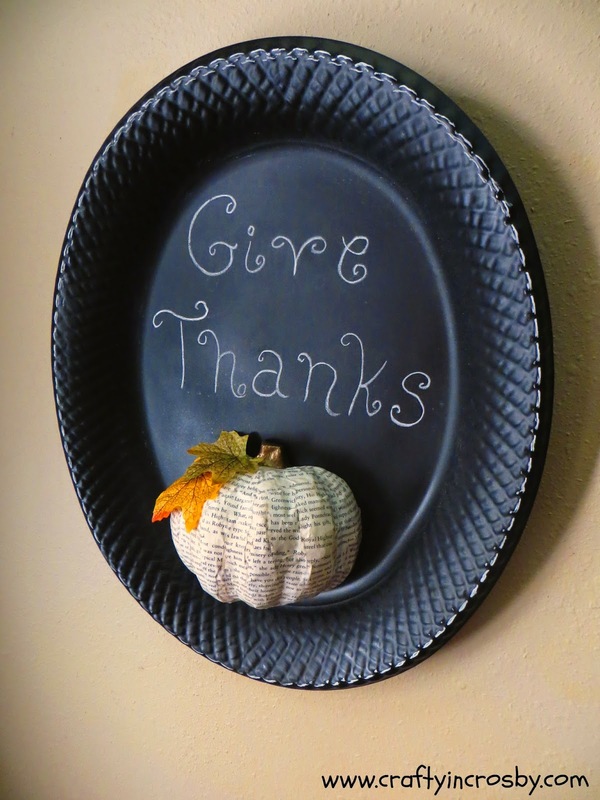 I'd had this picture in my mind of a chalkboard sign with a pumpkin on it for quite some time and I found the perfect plastic platter at Dollar Tree for the base. Not too bad for a couple of bucks and some supplies I already had on hand. The platter is just a large plastic party platter from Dollar Tree that I spray painted with chalkboard paint. The pumpkin also came from Dollar Tree. 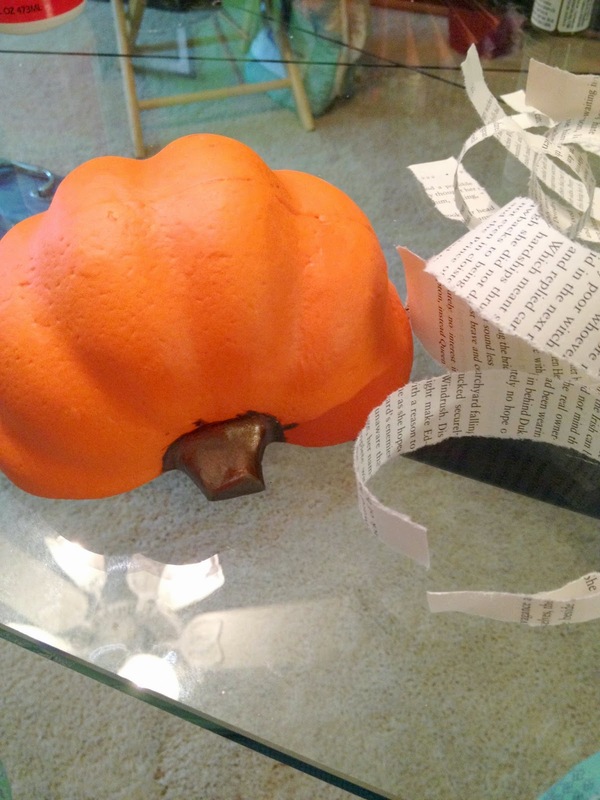 We cut it in half with a sharp kitchen knife, painted the stem gold and then Mod Podged strips of torn book pages over it. 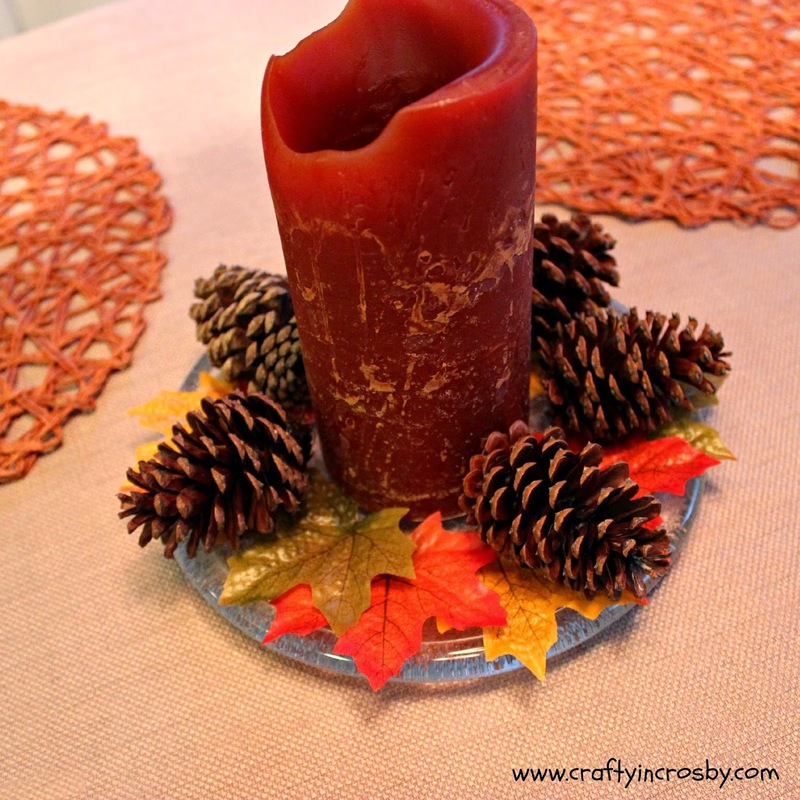 Add a few fall leaves (also from Dollar Tree) and hot glue it to the platter. 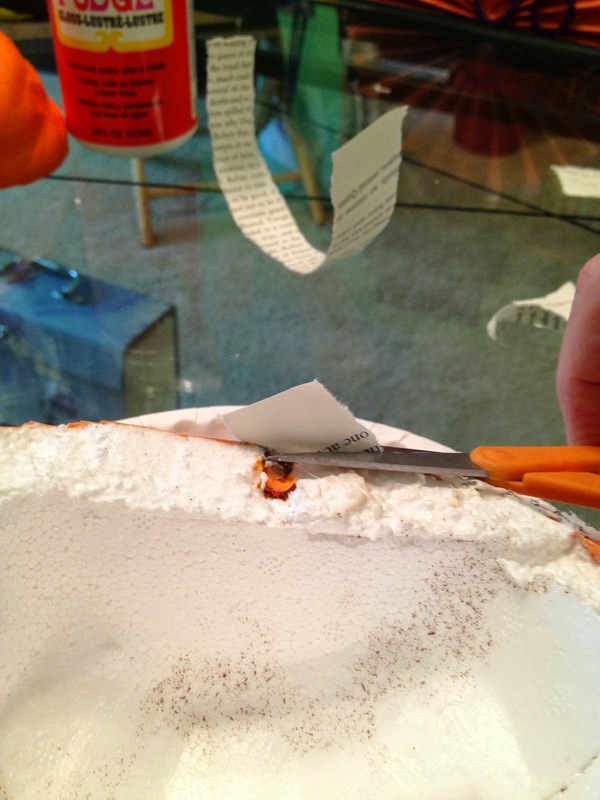 When you are Mod Podging the book strips you will need to trim the overlapping edges with scissors. 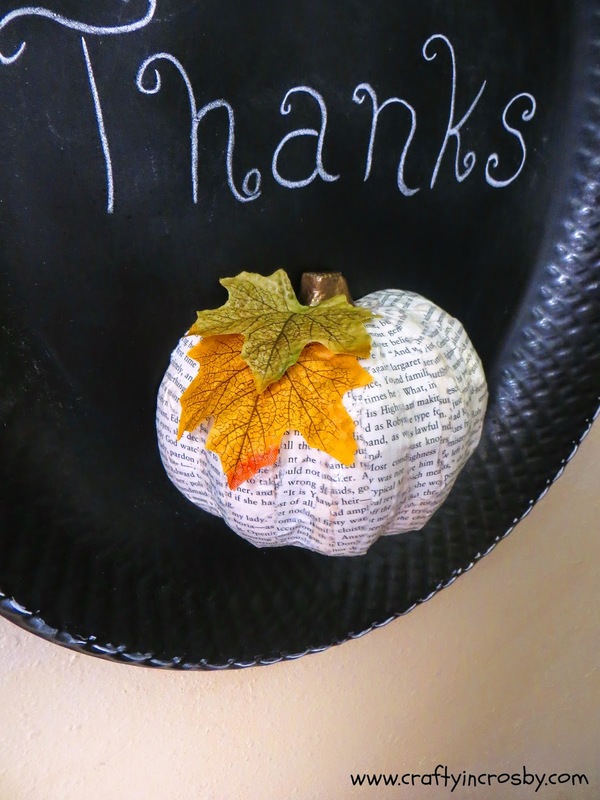 You could write any fall sentiment on the platter - Happy Thanksgiving, Happy Fall, Count Your Blessings, Autumn Blessings or anything you can think of. 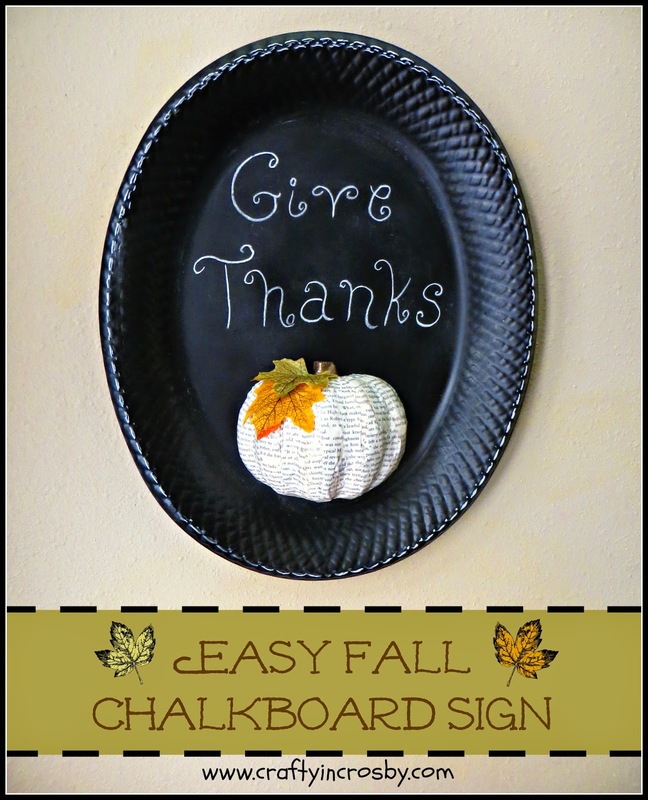 Don't forget to prime your chalkboard by running a piece of chalk (on it's side) over the flat part of the platter, then wipe off the chalk. I also ran the chalk around the outside edge of the platter to accent the edge. 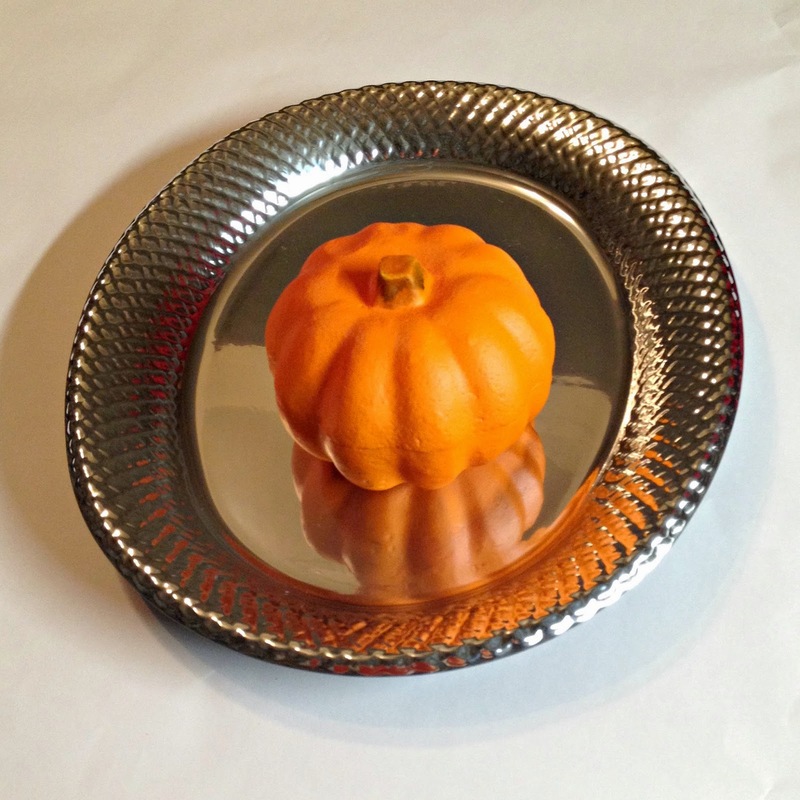 I also used one of my favorite DIY tricks on the back of the platter - use a soda can pop tab for a hanger - just hot glue it on to the platter with a generous dot of hot glue and place a small piece of paper over it to cover the glue. 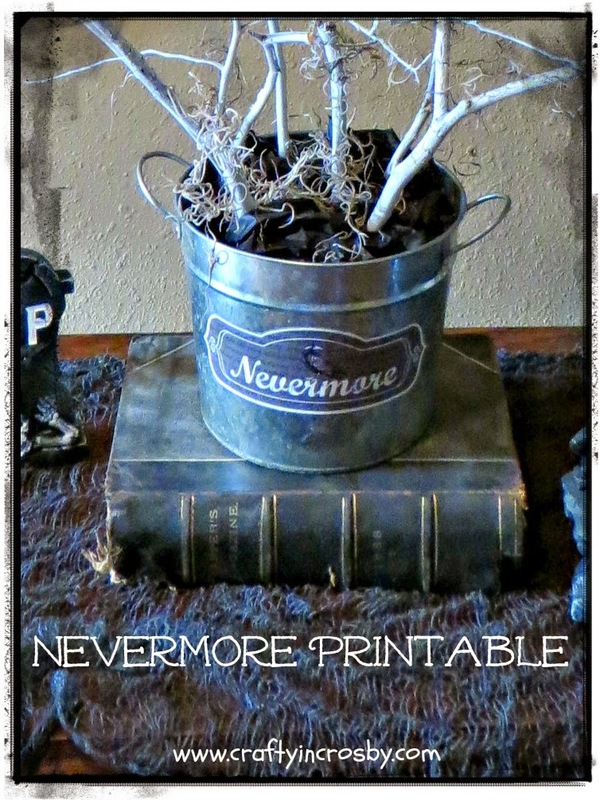 Such an easy craft for fall and Halloween and I love how it turned out. 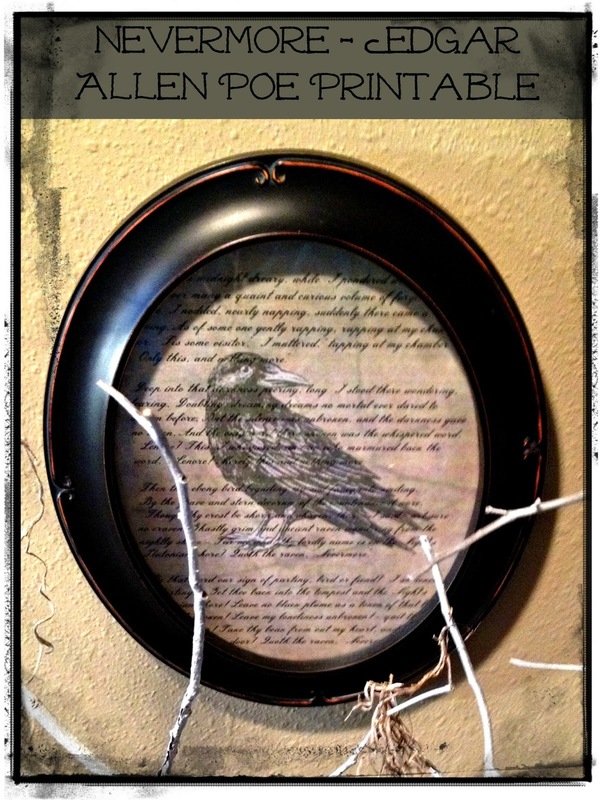 Two of our favorite things - chalkboards and book page crafts. Wishing everyone a Happy Fall Y'all! We cut the printable to fit in the oval frame that was already hanging in that spot, but it would also look great in a rectangular frame. Couldn't fit the entire poem on it but it has the beginning stanzas. This is the label on the tin bucket holding the tree. You can print it out and cut around the label to use it on your container. 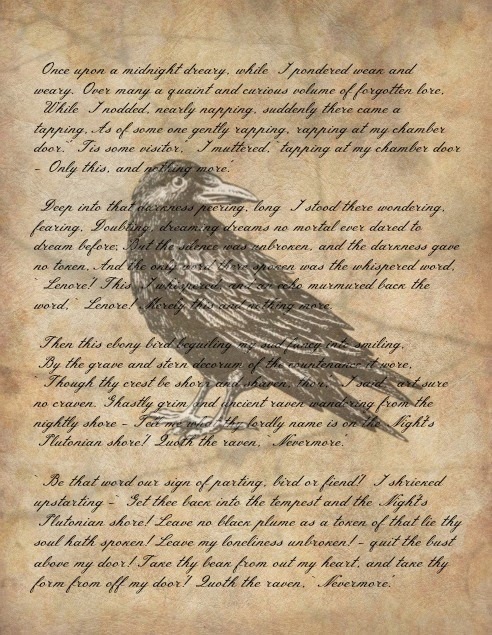 Last year, we also used some creepy cloth over the tops of the pictures and I had forgotten all about it until I was writing this post. Have to remember that for next year! 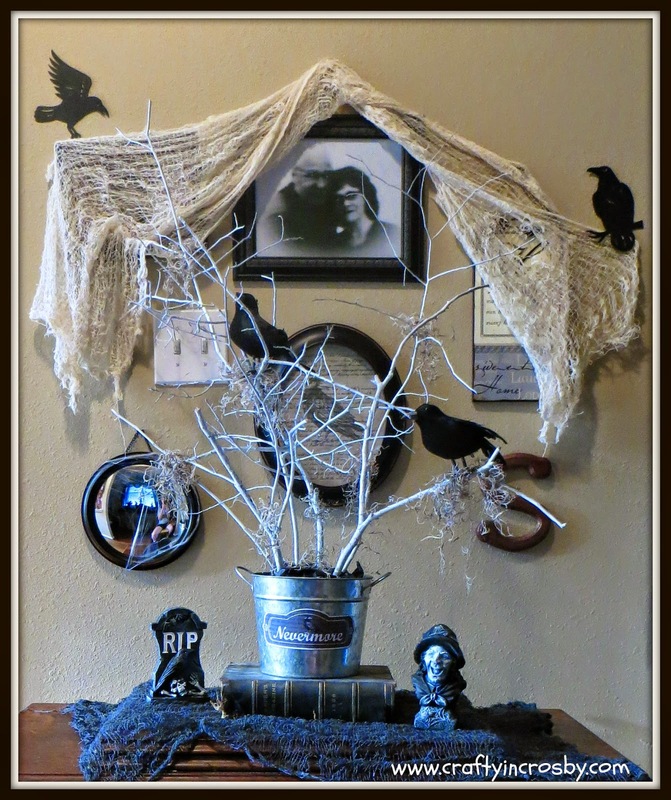 The photo at the top is my In-Law's and we spookified them in PicMonkey. They only look like this for Halloween, then this photo moves behind the real photo, although we might just leave it that way this year! Teeheehee!!! 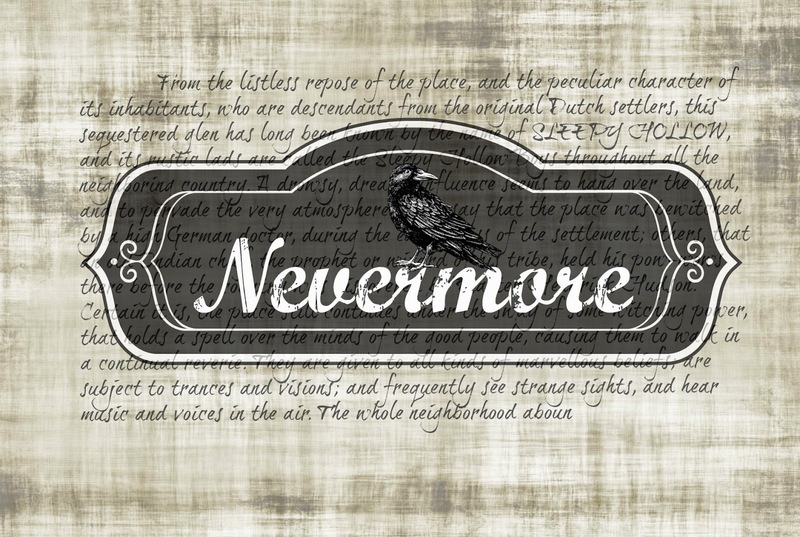 Might be too late to make your own Nevermore Tree, but there's always next year! Wishing everyone a safe and Happy Halloween!